In today’s busy lives, we don’t necessarily have time to call for appointments, be tasked to remember our future appointments, or even spend time browsing through a store for our hair salon products. 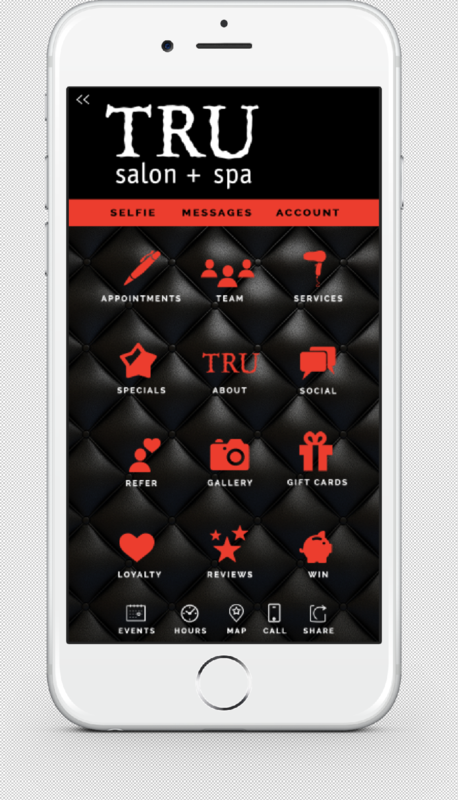 That’s why TRU Salon + Spa offers a free mobile app to help make your life a little easier. With our mobile app, you can simply select your preferred location, find the perfect day and time that suits your schedule, and then get an appointment reminder right from the mobile app. Want more from your app? Of course! · Buy a gift card for that special someone and have it delivered right to them! At TRU salon + spa we believe in giving back. With every visit you’ll receive points in our Guest Rewards program as well as referrals, product purchases, and more. Use them as cash toward future hair and skincare product purchases or from our boutique.